Maybe it's the kaleidoscope of color after rounding a high summit. Or a brilliantly dappled far-away ridge line just before sunset. Perhaps it’s the dazzle of vibrant hues in an ever-extending sea of oaks, poplars, and maples. Whatever the case, fall’s annual pageantry seems doubly impressive and rewarding when combined with a long hike, brisk trial run, or steady ascent up a windy mountain road. Few places are more spectacular during this hallowed time of year—or offer such a resplendent citadel of colors—than the Blue Ridge Mountains of Western North Carolina and Northeast Georgia. The entire region aims to please each October, providing a treasure trove of coveted vantage points from which to view the fleeting fall majesty. The key is knowing where and when to look. Below are four peak spots for peak color—each one made all the more vibrant by a healthy dose of outdoor adventure. 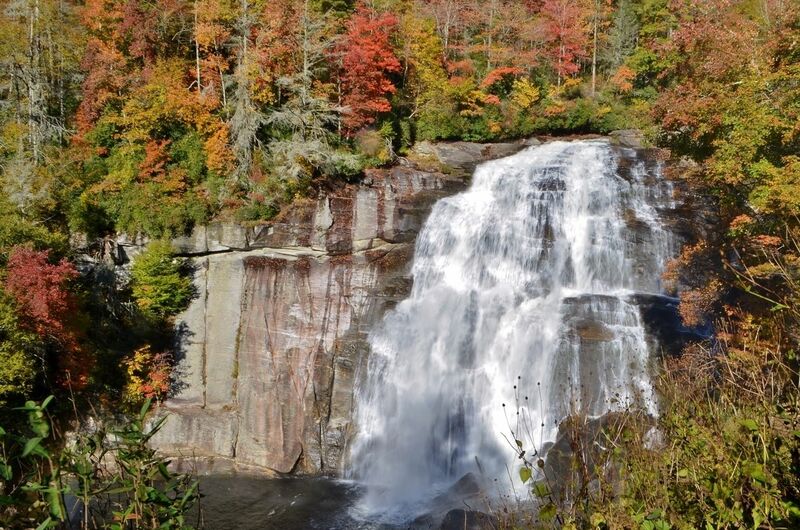 This is one of the crown jewels of the Pisgah National Forest. 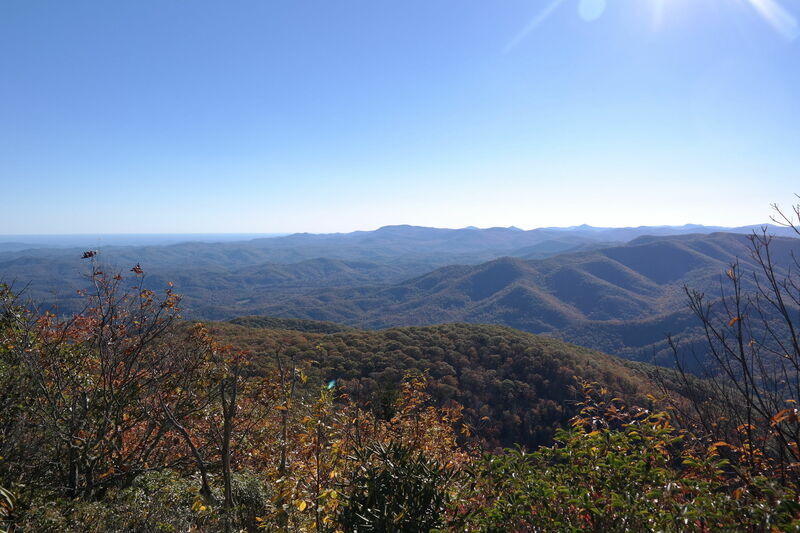 Located just a stone’s throw from Mountain Pisgah (and the always-delicious Pisgah Inn restaurant), the Art Loeb is long and challenging: nearly 30 miles of undulating hills and high elevation, all the way up to 6,200 feet at Black Balsam Mountain. It’s also one of the most mesmerizingly beautiful. It’s hard to overestimate the splendor of this section of trail that extends through the Shining Rock Wilderness and descends to Little East Fork Pigeon River. Throughout it all lies a seemingly endless succession of picturesque bald mountains that bestow 360-degree views and a wide array of color variation, depending on elevation and distance. One of the best things about this trail is that you can make it as long or as short as you like and enjoy stunning vignettes of fall foliage with virtually every stride. It's said that the profile of Yonah Mountain (or Mount Yonah, to some), resembles a resting bear. Yonah is, after all, the Cherokee word for bear. And it is indeed a well-known habitat for the very passive black bear, who is content to forage for food and berries, seldom pay any attention whatsoever to people. Yonah is also one of the finest, moderately strenuous hikes in all of North Georgia. It traipses through dense forest, wild-flower laced openings, up to magnificent rock outcroppings that reveal impeccable views of the valley below and rolling hills in the distance. 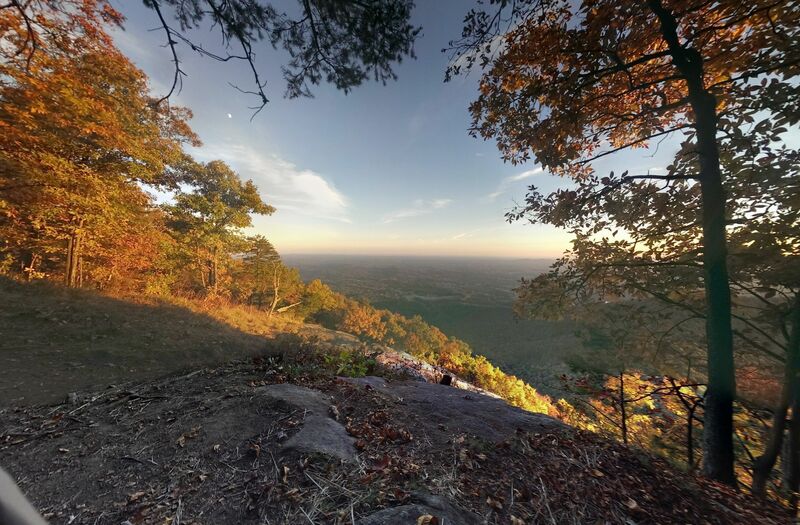 Fall is absolutely the perfect time to hike this iconic mountain, whose leaves will leave a lasting impression—much more indelible than the alleged image of a bear. Be sure to take plenty of water for this deceptively vertical 4.5-mile hike. What's up with all these crazy colors? Ever wonder why leaves change color? Lack of chlorophyll. This magical stuff gives the leaves their green hue in the spring and summer. But chlorophyll needs sunlight to feed the leaves. Lots of it. Without it, the chlorophyll breaks down. Due to the shorter days and cooler temps, the leaves stop this food-making process. The green color disappears, and the yellows, oranges, and reds become visible and give the world a spectacular masterpiece of color. Few towns in Western North Carolina are imbued with as much charm as Blowing Rock, located at 3,500+ feet. Recently voted one of America’s Best Small Towns by Expedia, Blowing Rock is a magical, Norman Rockwell-esque mix of mountain Americana: fine and casual restaurants, coffee shops, artsy boutiques, and curio shops. Best of all, it’s right off one of the best stretches of road you’ll ever find: the Blue Ridge Parkway, in the Heart of the High Country. This particular stretch of Parkway—that stretches north and south, revealing panoramic views and breathtaking vistas. In the fall, the wide range of hardwoods densely forested mountainsides guarantees some of the best leaf viewing in the country. Cyclists will find plenty of pull overs and overlooks to pause and take it all in. Additionally, the new 6.5-mile Middle Fork Greenway (along the New River) will soon connect Boone and Blowing Rock. This is the land of waterfalls...and streams and creeks and rivers and lakes. It’s also home to some of the best mountain biking in the Carolinas and Georgia. This fertile, rhododendron-filled valley contains a network of trails that is as inviting as it is vast. Cyclists have option after option in a valley that actually rests above 3,500 feet. Within this picturesque basin lies 30+ miles of trails—some short, some long, some easy, some hard—all offering up exquisite scenery and foliage during the month of October. Highlights include the lovely Blackrock trail that straddles a high ridge line, and Mac’s Gap, near Greenland Creek Falls. The best advice to mountain biking this valley is to simply go with the flow—there are no bad sections. Just one big network of paths and trails that immerse you in the wonder of the season’s multi-hued radiance.